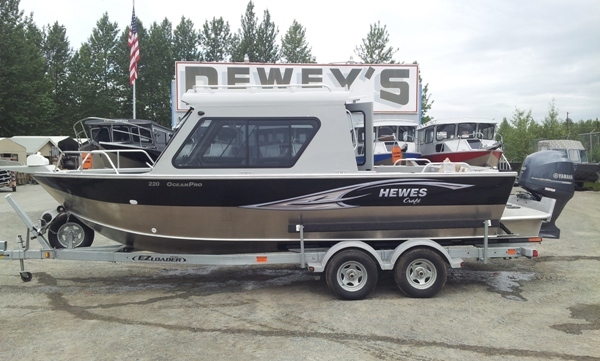 for anglers seeking the toughest, most-capable mid-sized fishing boat. So, naturally, competing brands have long pursued this boat’s safety, roominess, affordability, and fishability. With the Ocean Pro’s 2016 upgrades, they’re going to have to keep chasing. 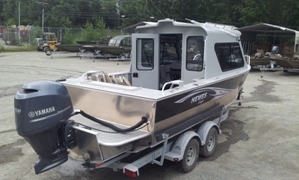 Its longer fishing deck, new 100-gallon fuel tank, roomier driving area, and enhanced performance combine to keep the Ocean Pro miles ahead of competing models. The Ocean Pro’s 2016 design upgrades have made an excellent boat even better. As with previous editions, the new Ocean Pro is listed at 22 feet in length. However, with the addition of five inches of overall hull length, a forward-justified console, and shortened open bow, the Ocean Pro now boasts seven more inches of space in the fishing cockpit. The enclosed cabin is as roomy as ever, and the improved driving position gives you more leg room. Added under-bow storage, a raised gunwale rail to keep water out of the cockpit, and an easy-drain deck will make your fishing and boat-owning experience better than you ever thought it could be. 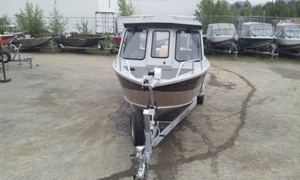 22' Ocean Pro Hard Top Yamaha F200 4-Stroke Spec. EZ Loader Trailer Spec. Beam 102" 2.8L Weight 1300 lbs.